Here in Alaska it has already snowed three times this winter. We spend our days finding ways to stay warm and snuggly. One of our favorite pastimes is reading books while cuddling under a big blanket, followed by hot chocolate. However, we still have to go to school and we still have to run errands. Unfortunately, we can’t stay cozy at home all the time. We have quickly found ways to stay warm outside too, and thanks to Lost. Found., my kids are even more obsessed with learning how to knit! I received compensation for this post, all ideas are my own. My kids have very talented grandmothers who both knit. From their first pair of newborn booties to gorgeous blankets and gifts they have been spoiled with beautiful knit gifts their whole lives. The grand babies have always been curious about their clicking needles but after reading Lost. Found. over and over again, their curiosity about knitting has peaked! 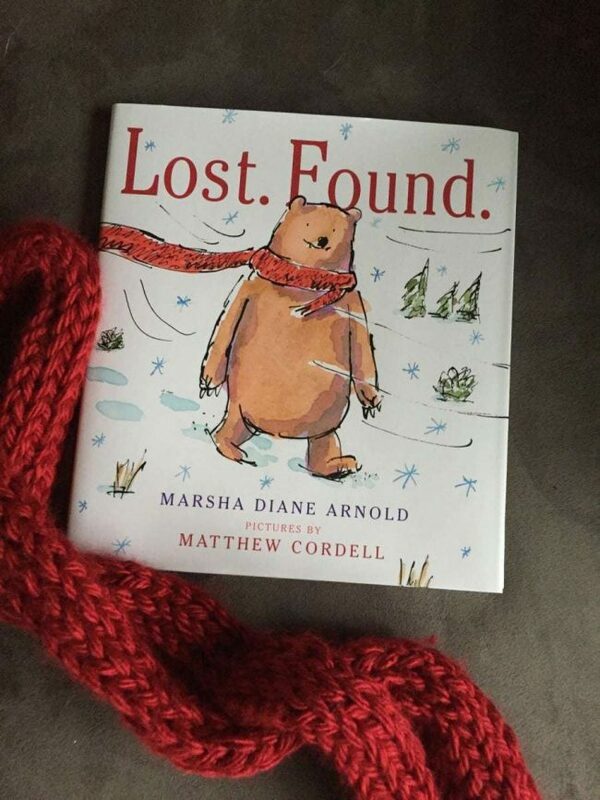 In this fun book by Marsha Diane Arnold, playfully illustrated by Matthew Cordell, Bear has lost his beautiful red scarf. It is found by some raccoons who use it for a game of tug of war. Then it is found by a beaver who uses it as a hat. Over and over that wonderful scarf is lost and found and when everyone decides they want it at the same time, it needs some repair. One of my favorite things about this book is it is nearly wordless. My four-year-old is an early reader. He loves to sound out words and longs to read a book by himself, but a whole book of words is overwhelming. Because the words are repetitive, he can sound them out and then read the whole book on his own! It is so fun to watch! In the spirit of Lost. Found I set out to find a way for my toddlers chubby hands to knit! Now your kids can too! Start by glueing popsicle sticks around the outside of your roll. I chose to use six wider sticks knowing that my kids hands are still working on very fine motor skills. You can use smaller sticks and put them closer together if your kids are older. The width of the sticks and the length of space between them will change the size of your stitch. Next, wrap the outside of the tube with washi tape to cover up the sticks and make the tube smooth. Plus, if siblings are knitting, it will help you tell their looms apart. Now that you have a loom, watch this video for a tutorial on loom knitting. Once you get going, it really moves pretty quickly. We whipped up our favorite bear a red scarf in one afternoon, it makes him a little more snuggly than normal. Make sure to grab a copy of Lost. Found. for your family this winter, it is the perfect book to get cozy with a friend and read. Have you or your kids ever tried kitting? forget the toilet paper rolls, they can be quite germy, try the rolls Christmas wrapping paper comes on, it’s a lot cleaner and sturdier. the tutorial. Any idea why I am unable to view it. Oh no! Try this link https://www.youtube.com/watch?v=D5JdB-M14nI I hope that helps! Hi, Aimee ~ This is such a cute idea! 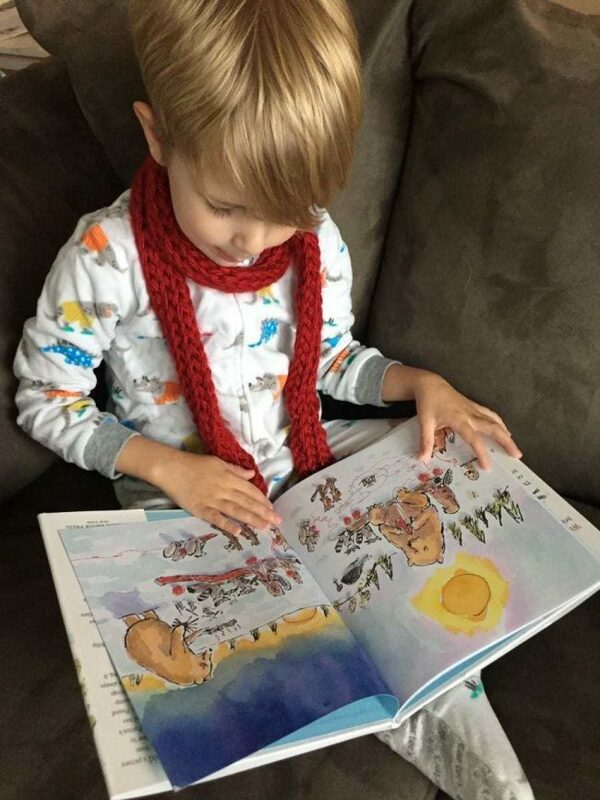 And I love that your kiddo’s scarf matches the one in the book. Thanks for sharing with us at the Merry Monday Link Party. Hope to see you again on Sunday night! What a cute crafting concept! This will introduce kids to the idea of knitting, but in an easier way they can manage! I absolutely love this. What a great idea to help children knit. In my KidLitFrenzy blog I wrote, “One of the ways I envision is to “cast on” (knitting term, as well as fishing term, sailing term and more), at one school and knit a bit, then continue knitting the red scarf from school to school until we connect the whole world as one big community of cooperation and contentment.” You have made a wondrous start here. Thank you. What a neat idea. The girls will totally love this. Knitting is fun. That is a great craft! 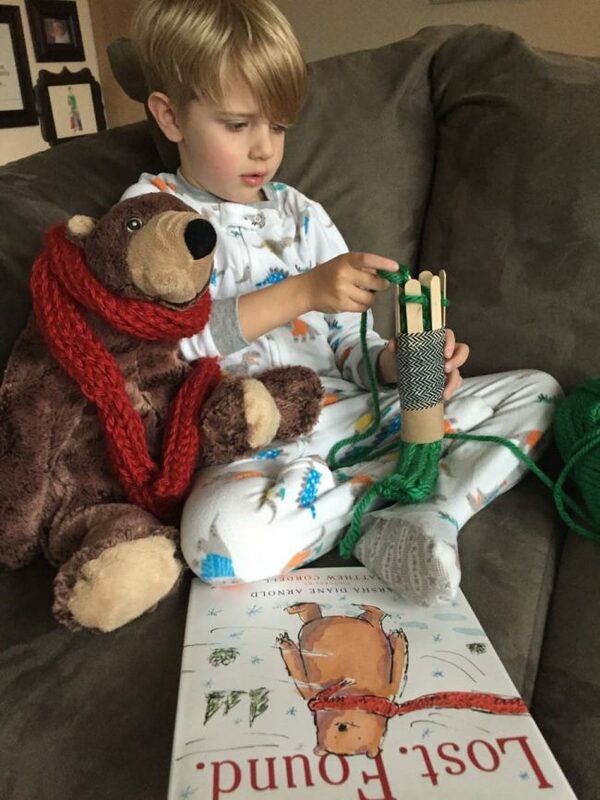 It is a an awesome way to teach children to begin knitting. 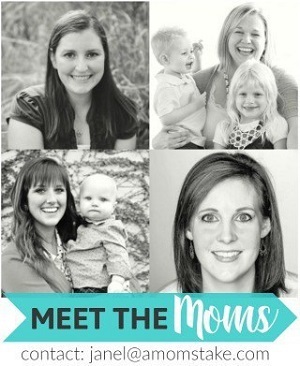 I may have to try this out with my children! 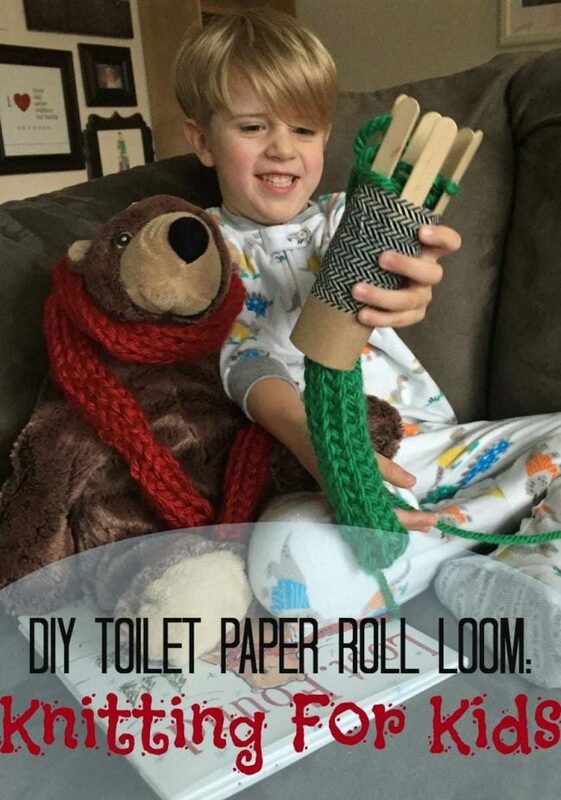 What a fun kid’s craft and clever way to recycle a paper roll tube. I remember when I was a child my dad made us something similar with a empty wood thread spool. What a cute craft for kids!! I never would have thought to make a loom like this for the kids to use. This is so clever! 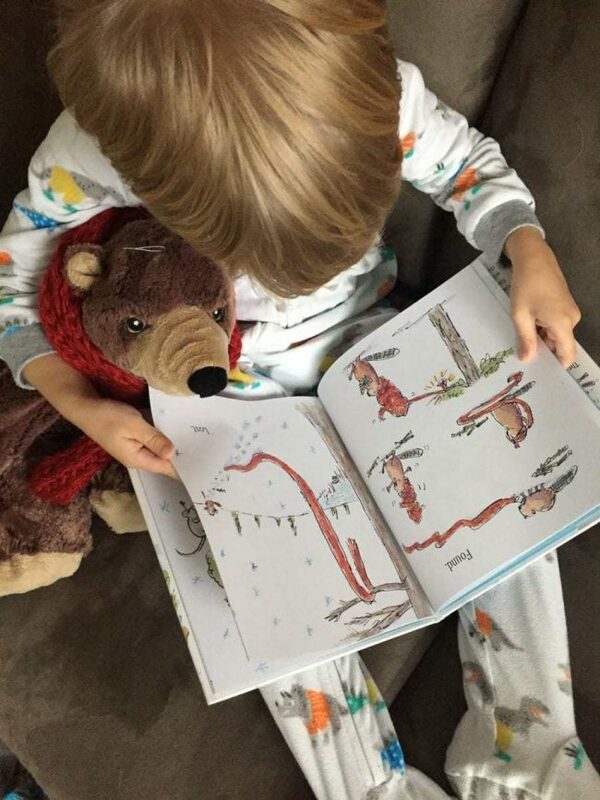 Your son looks like he loves the book and the bear’s new scarf. What a great, inexpensive idea. The looms you buy in store can be costly. 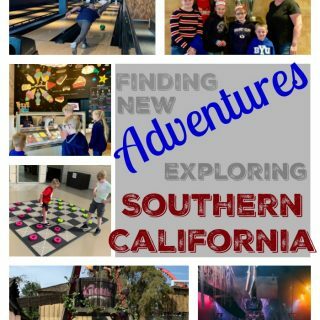 This looks like a great book and even though my kids are older they would have enjoyed it when they were younger. I’ve never heard of this book but will be looking for it. My daughter would love this. She has asked about knitting before, after seeing it online, but I don’t know how. Maybe we could use this technique and learn together. Thank you so much for the book suggestion and fun “craft” to get us moving in the right direction with knitting! I have never personally tried knitting anything, and obviously that my kids haven’t either. I wouldn’t even know where to start, but the homemade loom looks pretty easy. What a neat concept, my daughter uses a CD and some other thing as a spindle for her to make yarn out of my Gram’s sheep whool. This looks like a great story for kids. It would make a great Christmas gift for a few kids i know. My kids would love to try knitting. I will have to try this with them. I love this book. It is a great story. It is so much fun to see your child find a book they really enjoy. 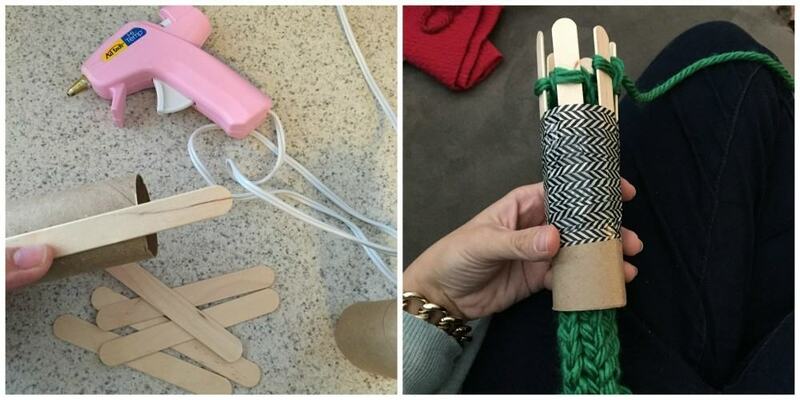 This DIY loom is just genius! 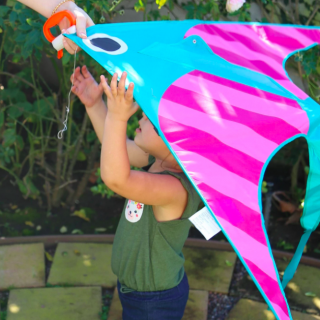 What a creative way for little ones to learn. My daughter would love to learn how to knit, I think she would like to learn it this way! Aww, the bear looks adorable with his little scarf. Knitting is a bit advanced for me so I might try this out to see if I can knit something a little more basic. I totally pinned this idea! I’m always looking for fun new books – and we love to match up a craft or project with our books. LOVE this!!! 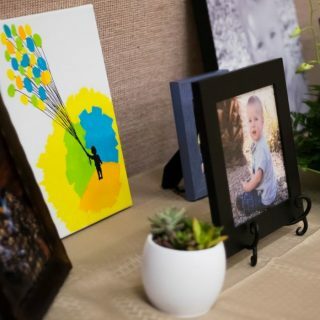 this looks like such a fun craft for kids! 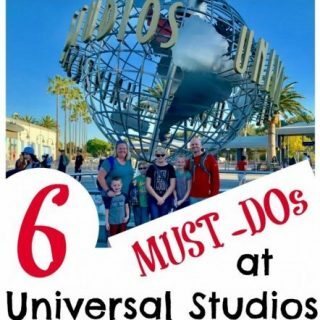 Heck, i think I’ll even give it a go! What a fun way to craft! I bet my kiddo would love to do something like this. I am going to try this with him. I think that’s awesome. It’s so important to teach our kids how to do things like this. It helps their creativity. This sounds like a great book. I love the loom knitting craft you paired with it. That’s a great way to make reading fun. I have thought about it, but have yet to try it. One of these days…..